Ok guys, I thought I’d share something a little different. It’s only taken me 6 months to edit my own personal photos of this birthday party but I thought it was time. I may have cried a little looking back at these and seeing how big my “not-so-little” guy is getting. I’ve been trying to get this done all summer and finally I had the chance! If you know me it’s no secret that I go completely overboard on making my kiddo’s birthday parties unique. I know my family just loves me for this, especially my husband;) Let me just say these parties would never happen this way without the amazing help and work from my incredible family! So a big thank you to my wonderful helpers who are always there to support me, even if I do keep them awake until 4am preparing for a birthday party for a 4 year old, lol. I was sooooo excited when my 4 year old told me he wanted to have a Peter Pan birthday party this year. I love that he chose something so classic to fall in love with. It was such a fitting theme for this year as well. He’s grown so much developmentally and he’s really starting to look like a big boy instead of a toddler. So of course, I immediately started looking through everything I could find on Pinterest, which I got sucked into for several hours. I always love to read how and where people get things for their events, so I’m going to share those details with you. 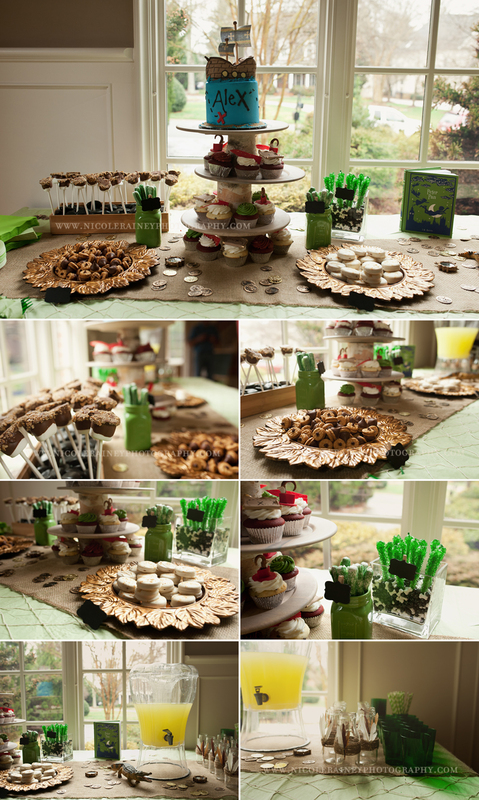 Just in case you ever plan a Peter Pan party and need somewhere to start. I will say Peter Pan products are NOT easy to find right now. 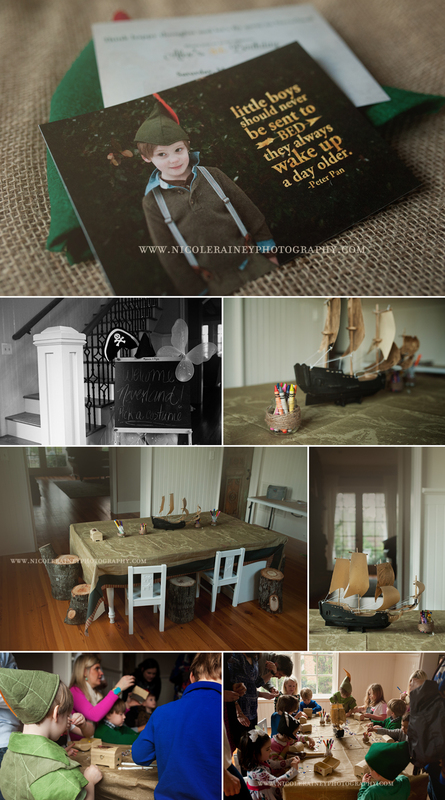 I started with designing the invites on my own using images from our little mini Peter Pan shoot we did beforehand. This helped set the stage for colors and style of the party. The Peter Pan hat (which he wore constantly at this point) is a hand me down from my nephew and we used it as the guide for the Peter Pan hats for the party. I found fairy wings at the dollar store and pirate hats from Oriental Trading. I also got the little treasure boxes, jewels, coins and compasses that we used for the party activity along with the pirate hats. They used the treasure boxes they decorated to take home treasure from the big treasure box full of toys, beads, and candy at the end of the party. I also bought inflatable “diy” swords (they were really the size of a dagger, which was perfect for my needs) from Oriental Trading. I actually didn’t mean to buy blank white swords, I thought they were pre-decorated. So I did have to figure out how to paint/color on plastic. It’s not easy! I had to put several coats of color paint and then spray painted some gold glitter on top. It lasted just long enough to get us through the party. I just trashed them afterwards. The cake and cupcakes were made by the amazingly talented Deb at Deb’s Sweet Cakes. Guys…they were just as delicious as they were beautiful, chocolate chip and red velvet cupcake flavors, yum! The other treats were pretty easy; store bought and dipped in different chocolates then decorated. I completely spaced on my cake table here and forgot to put the cute little names for the foods on them. Like, the rock candy was suppose to represent “skull rock,” the marshmallows were a play on the Indian campfire from the book and the acorns were the kiss from Peter to Wendy. You guys get the picture:) I tried to use toys we already had around the house which helped keep my decorating costs down. Alex and I found the black and gold ship at a discount store and put it together the week before. He thought it would be so much fun. Yeah, as you can see I had to do most of the work on that project. It was much more complicated than expected. I made the cake stand and we put the bottles together with twine and feathers. I found a lot of the other serving platters at Marshalls (I think). 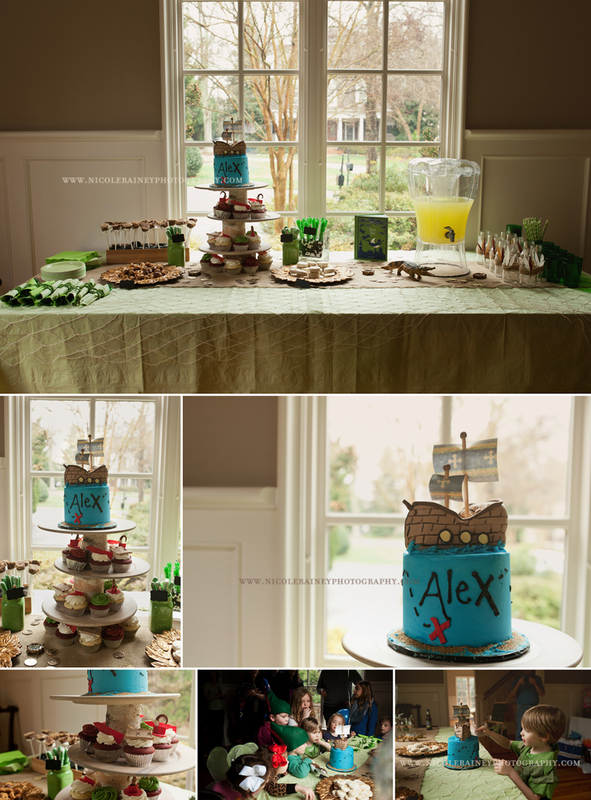 When we decided on this theme, A’s requests were 1) a ship cake (check!) and 2) an actual ship (check! check!). He told me he wanted my sister to make it. This amazing card board boat was above and beyond anything I would have put together. She did such a good job and I know the kids had a great time on it. I know mine have for the last 6 months, because it’s still standing in my living room. Yes, that ship has a cannon shooter on the side of it! After finishing up their treasure boxes, the kids played for a while on the ship and then busted a treasure box piñata with a wooden sword (again something we already had), because you can’t have a party without a piñata full of candy. I just know all of these kid’s parents were so excited I sugared their kids up and then sent them home with more candy, lol. Yep, I’m that mom. Sorry! Well, all good things must come to an end but my littlest wasn’t very happy about it. Here’s a few of our crew and a few ending shots from the day. It was really an amazing party that I’m so glad I got the chance to actually take pictures of this year. I’m usually running around so much that I don’t have time to document the day. Well not this year! I actually managed to get a shot with me in it (thanks to my hubby). We even got to celebrate with all the left over cake for the next few days after the party.